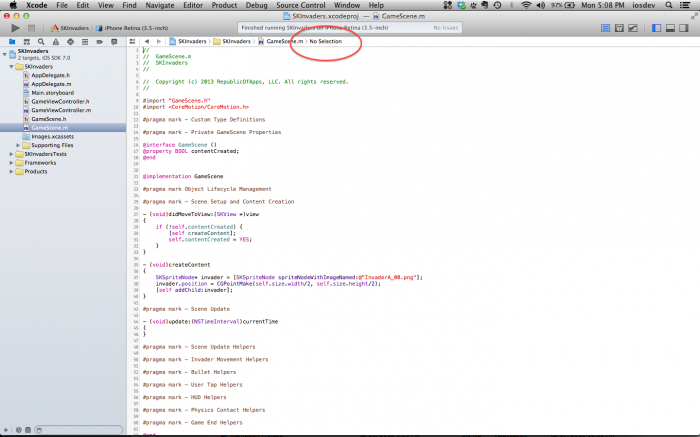 Update Note 10/29/2014: Check out the updated version of this tutorial using iOS 8 and Swift! 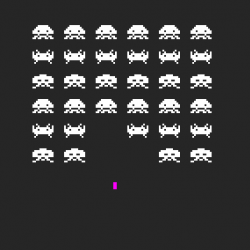 Space Invaders is one of the most important video games ever developed. Created by Tomohiro Nishikado and released in 1978 by Taito Corporation, it earned billions of dollars in revenue. It became a cultural icon, inspiring legions of non-geeks to take up video games as a hobby. 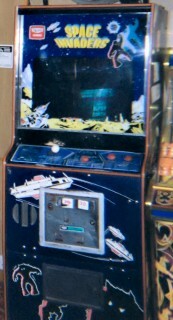 Space Invaders used to be played in big game cabinets in video arcades, chewing up our allowances one quarter at a time. When the Atari 2600 home video game console went to market, Space Invaders was the “killer app” that drove sales of Atari hardware. 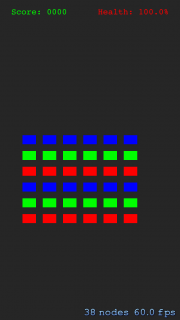 In this tutorial, you’ll build an iOS version of Space Invaders using Sprite Kit, the 2D game framework newly introduced in iOS 7. This tutorial assumes you are familiar with the basics of Sprite Kit. If you are completely new to Sprite Kit, you should go through our Sprite Kit tutorial for beginners first. Also, you will need an iPhone or iPod Touch running iOS 7 and an Apple developer account in order to get the most out of this tutorial. That is because you will be moving the ship in this game using the accelerometer, which is not present on the iOS simulator. If you don’t have an iOS 7 device or developer account, you can still complete the tutorial — you just won’t be able to move your ship. Without further ado, let’s get ready to blast some aliens! Apple provides an XCode 5 template named Sprite Kit Game which is pretty useful if you want to create your next smash hit from scratch. However, in order to get you started quickly, download the starter project for this tutorial. It’s based on the Sprite Kit template and already has some of the more tedious work done for you. 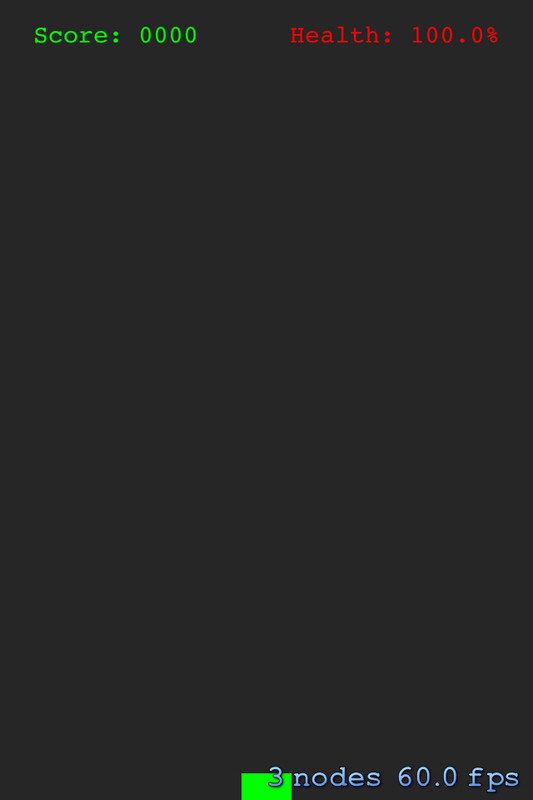 Once you’ve downloaded and unzipped the project, navigate to the SKInvaders directory and double-click SKInvaders.xcodeproj to open the project in Xcode. Creepy – the invaders are watching you already! However, if you see the screen above, this means you’re ready to move forward. 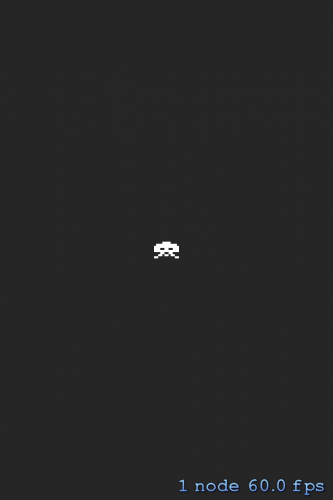 To complete your Space Invaders game, you’ll have to code several independent bits of game logic; this tutorial will serve as a great exercise in constructing and refining game logic. It will also reinforce your understanding of how Sprite Kit elements fit together to produce the action in a game. Most of the action in your game takes place in the stubbed-out GameScene class. 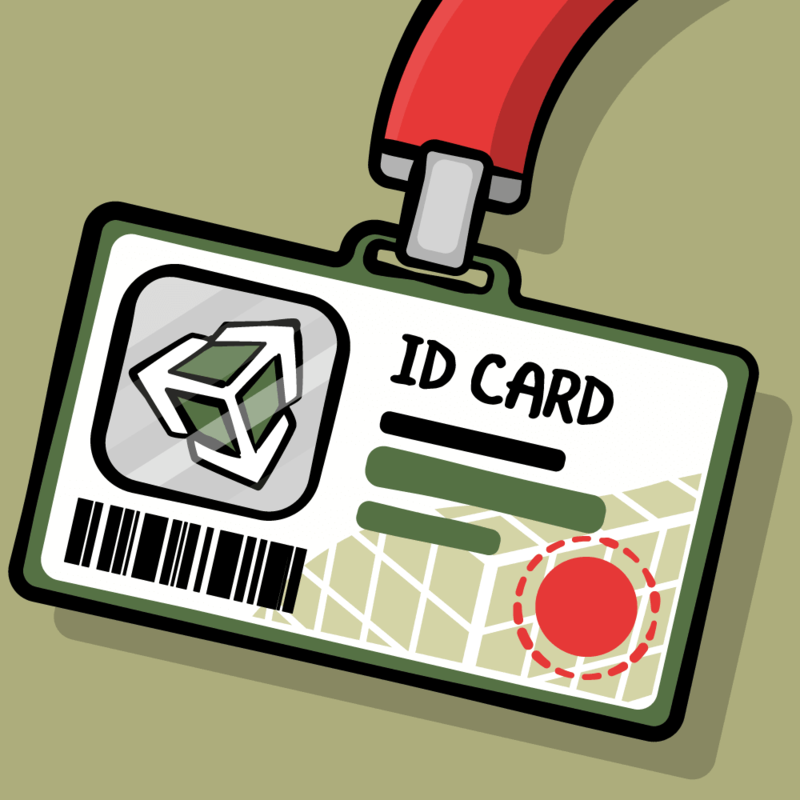 You’ll spend most of this tutorial filling out GameScene with your game code. Let’s take a look at how the game is set up. Open GameViewController.m and scroll down to viewDidLoad. This method is key to all UIKit apps and runs after GameViewController loads its view into memory. 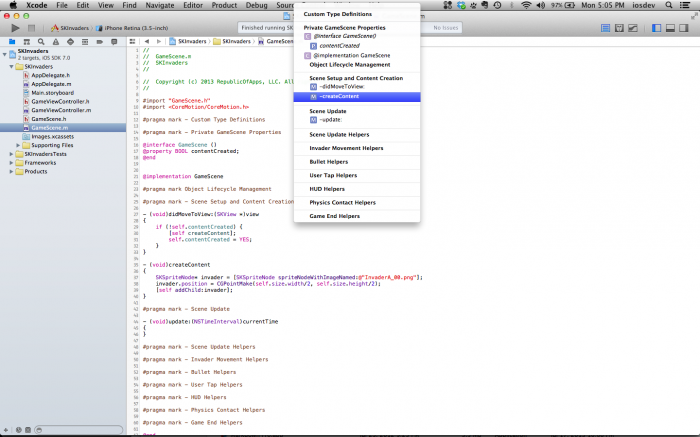 It’s intended as a spot for you to further customize your app’s UI at runtime. //1 Create and configure the scene. First, create the scene with the same dimensions as its containing view. scaleMode ensures that the scene is large enough to fill the entire view. Next, present the scene to draw it on-screen. Once GameScene is on-screen, it takes over from GameViewController and drives the rest of your game. You’ll notice that there are a lot of #pragma mark - Something or Other type lines in the file. These are called compiler directives since they control the compiler. These particular pragmas are used solely to make the source file easier to navigate. Before you start coding, take a moment to consider the GameScene class. When is it initialized and presented on screen? When is the best time to set up your scene with its content? As the pragma points out, this class extension allows you to add “private” properties to your GameScene class, without revealing them to other external classes or code. You still get the benefit of using Objective-C properties, but your GameScene state is stored internally and can’t be modified by other external classes. 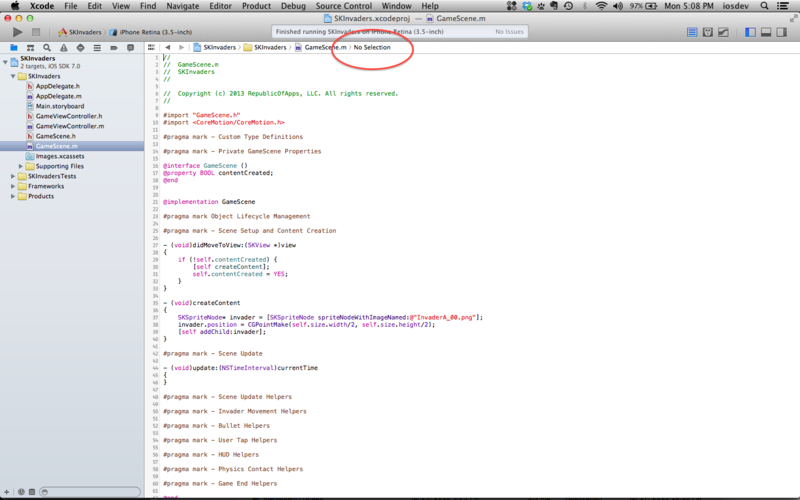 As well, it doesn’t clutter the namespace of datatypes that your other classes see. Define the possible types of invader enemies. You can use this in switch statements later when you need to do things such as displaying different sprite images for each enemy type. 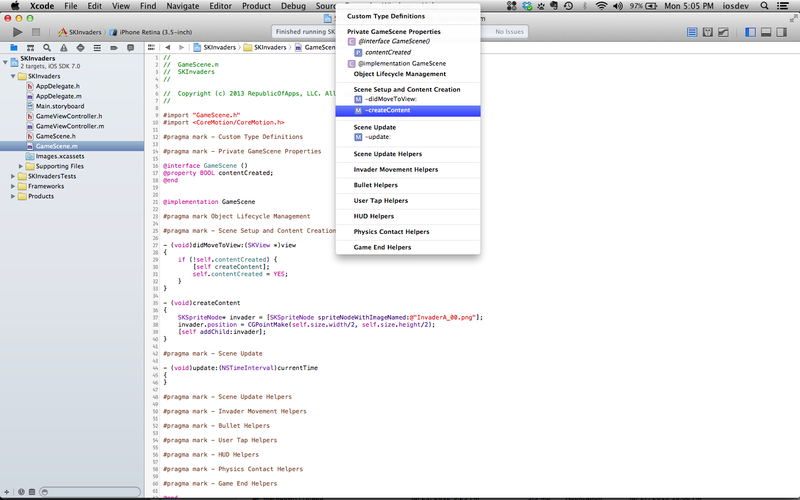 The typedef also makes InvaderType a formal Objective-C type that is type-checked for method arguments and variables. This ensures that you don’t pass the wrong method argument or assign it to the wrong variable. Define the size of the invaders and that they’ll be laid out in a grid of rows and columns on the screen. Define a name you’ll use to identify invaders when searching for them in the scene. It’s good practice to define constants like this rather than using raw numbers like 6 (also known as “magic numbers”) or raw strings like @"invader" (“magic strings”) that are prone to typos. Imagine mistyping @"Invader" where you meant @"invader" and spending hours debugging to find that a simple typo messed everything up. Using constants like kInvaderRowCount and kInvaderName prevents frustrating bugs — and makes it clear to other programmers what these constant values mean. 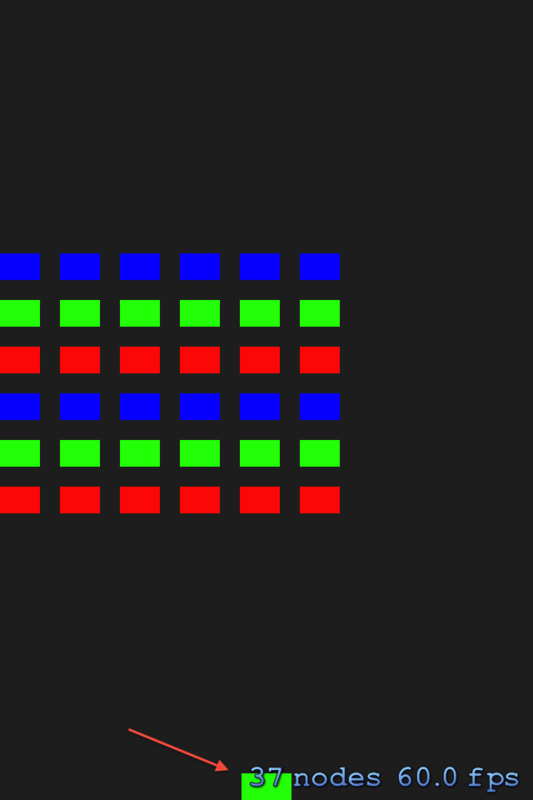 Use the invaderType parameter to determine the color of the invader. Call the handy convenience method spriteNodeWithColor:size: of SKSpriteNode to allocate and initialize a sprite that renders as a rectangle of the given color invaderColor with size kInvaderSize. Okay, so a colored block is not the most menacing enemy imaginable. It may be tempting to design invader sprite images and dream about all the cool ways you can animate them, but the best approach is to focus on the game logic first, and worry about aesthetics later. 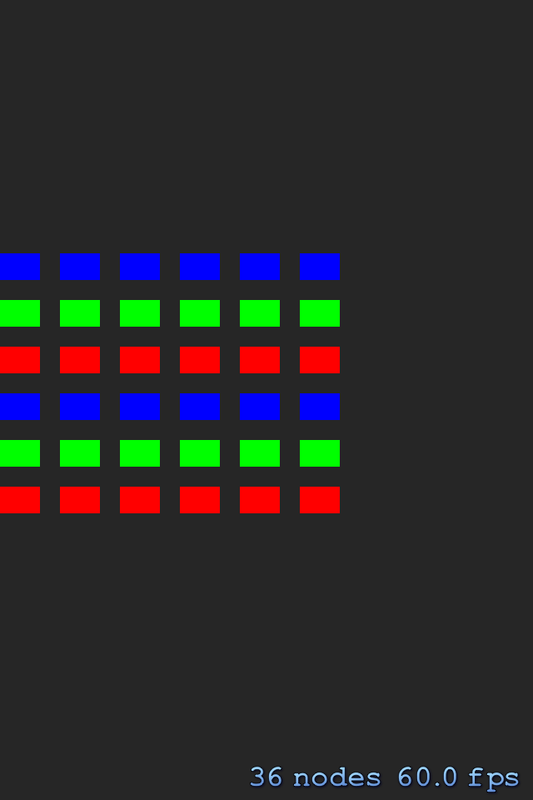 Adding makeInvaderOfType: isn’t quite enough to display the invaders on the screen. You’ll need something to invoke makeInvaderOfType: and place the newly created sprites in the scene. Choose a single InvaderType for all invaders in this row based on the row number. Do some math to figure out where the first invader in this row should be positioned. Create an invader for the current row and column and add it to the scene. 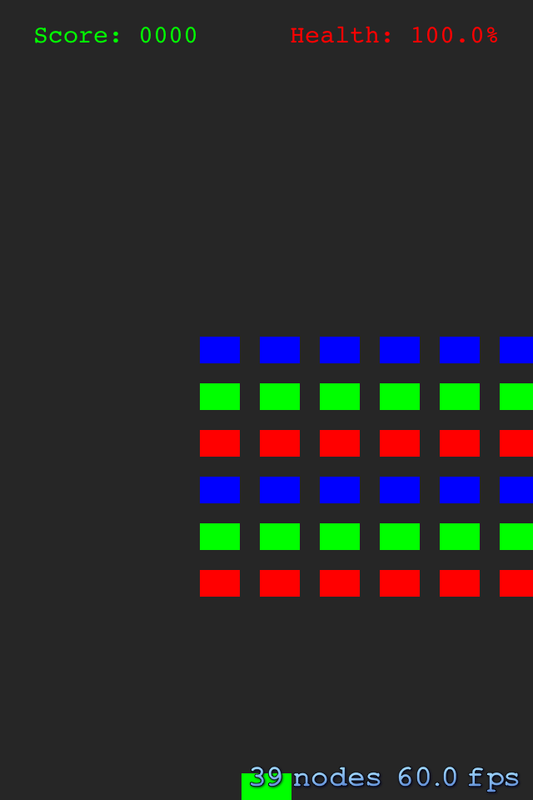 Update the invaderPosition so that it's correct for the next invader. With those evil invaders on screen, your mighty ship can't be far behind. Just as you did for the invaders, you first need to define a few constants. kShipSize stores the size of the ship, and kShipName stores the name you will set on the sprite node, so you can easily look it up later. Create a ship using makeShip. You can easily reuse makeShip later if you need to create another ship (e.g. if the current ship gets destroyed by an invader and the player has "lives" left). Place the ship on the screen. 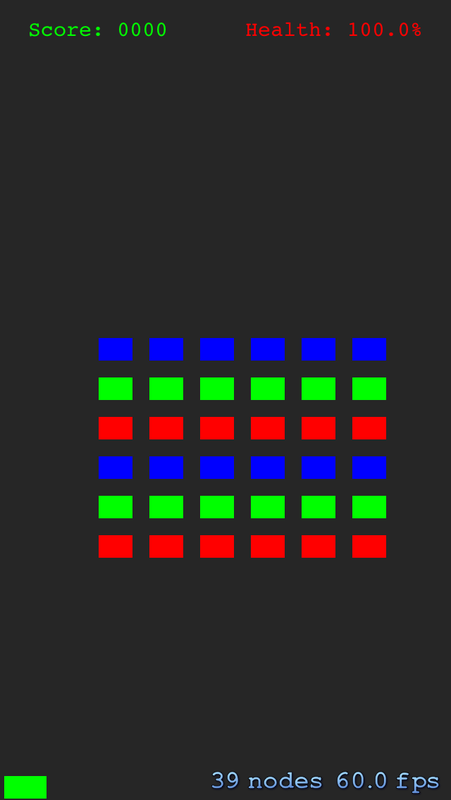 In Sprite Kit, the origin is at the lower left corner of the screen. The anchorPoint is based on a unit square with (0, 0) at the lower left of the sprite's area and (1, 1) at its top right. Since SKSpriteNode has a default anchorPoint of (0.5, 0.5), i.e., its center, the ship's position is the position of its center. Positioning the ship at kShipSize.height/2.0f means that half of the ship's height will protrude below its position and half above. If you check the math, you'll see that the ship's bottom aligns exactly with the bottom of the scene. Fear not, citizens of Earth! Your trusty spaceship is here to save the day! It wouldn't be much fun to play Space Invaders if you didn't keep score, would it? You're going to add a heads-up display (or HUD) to your game. As a star pilot defending Earth, your performance is being monitored by your commanding officers. They're interested in both your "kills" (score) and "battle readiness" (health). Give the score label a name so you can find it later when you need to update the displayed score. Color the score label green. Position the score label near the top left corner of the screen. Give the health label a name so you can reference it later when you need to update the displayed health. Color the health label red; the red and green indicators are common colors for these indicators in games, and they're easy to differentiate in the middle of furious gameplay. Position the health label near the top right corner of the screen. Invaders? Check. Ship? Check. HUD? Check. Now all you need is a little dynamic action to tie it all together! 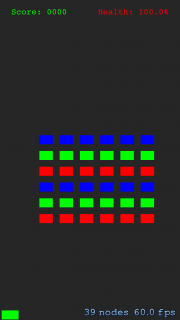 To render your game onto the screen, Sprite Kit uses a game loop which searches endlessly for state changes that require on-screen elements to be updated. The game loop does several things, but you'll be interested in the mechanisms that update your scene. You do this by overriding the update: method, which you'll find as a stub in your GameScene.m file. 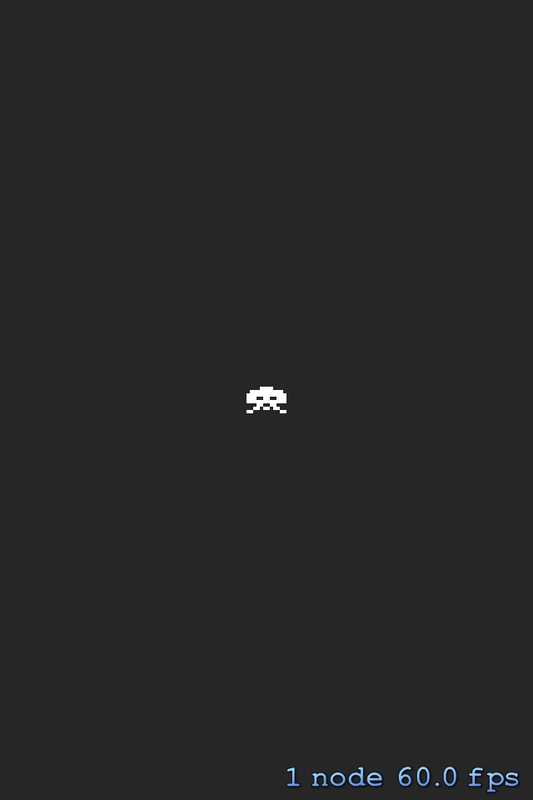 You'll use update: to make your invaders move across and down the screen. Each time Sprite Kit invokes update:, it's asking you "Did your scene change? ", "Did your scene change?"... It's your job to answer that question — and you'll write some code to do just that. Invaders move in a fixed pattern: right, right, down, left, left, down, right, right, ... so you'll use the InvaderMovementDirection type to track the invaders' progress through this pattern. For example, InvaderMovementDirectionRight means the invaders are in the right, right portion of their pattern. Invaders begin by moving to the right. Invaders take 1 second for each move. Each step left, right or down takes 1 second. Invaders haven't moved yet, so set the time to zero. If it's not yet time to move, then exit the method. 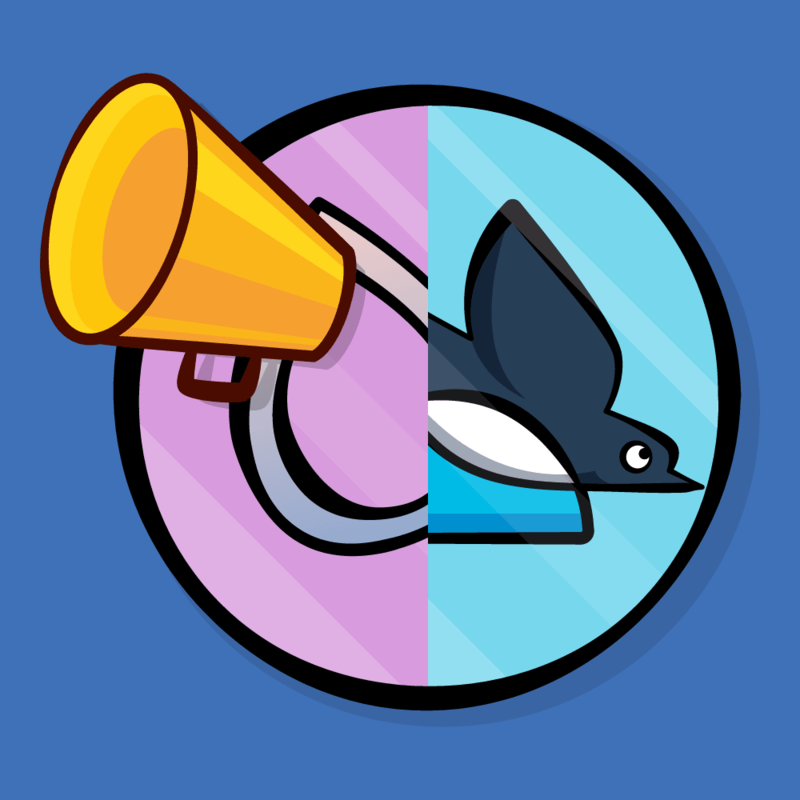 moveInvadersForUpdate: is invoked 60 times per second, but you don't want the invaders to move that often since the movement would be too fast for a normal person to see. Recall that your scene holds all of the invaders as child nodes; you added them to the scene using addChild: in setupInvaders identifying each invader by its name property. Invoking enumerateChildNodesWithName:usingBlock: only loops over the invaders because they're named kInvaderName; this makes the loop skip your ship and the HUD. 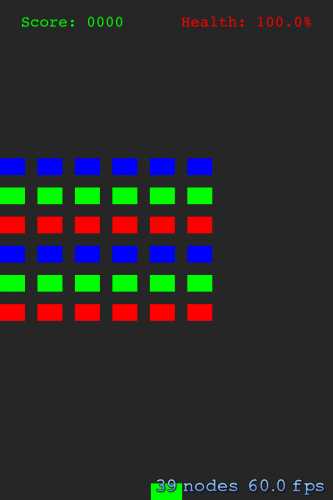 The guts of the block moves the invaders 10 pixels either right, left or down depending on the value of invaderMovementDirection. Record that you just moved the invaders, so that the next time this method is invoked (1/60th of a second from now), the invaders won't move again till the set time period of one second has elapsed. Hmmm, what happened? Why did the invaders disappear? Maybe the invaders aren't as menacing as you thought! The invaders don't yet know that they need to move down and change their direction once they hit the side of the playing field. Guess you'll need to help those invaders find their way! Since local variables accessed by a block are by default const (that is, they cannot be changed), you must qualify proposedMovementDirection with __block so that you can modify it in //2. 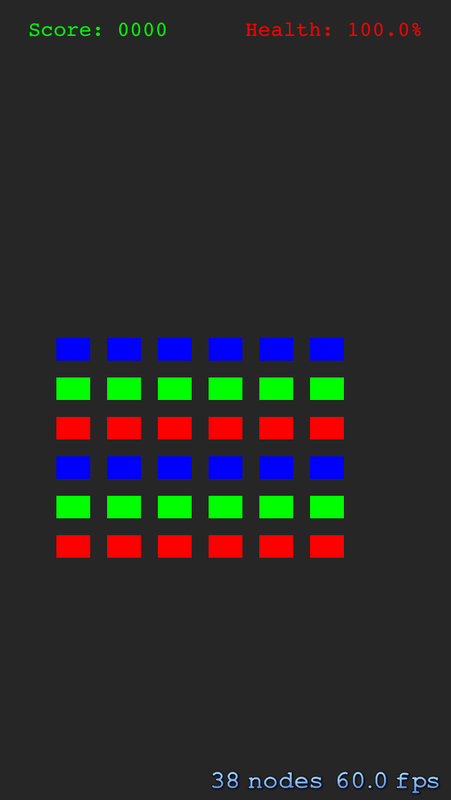 Loop over all the invaders in the scene and invoke the block with the invader as an argument. If the invader's right edge is within 1 point of the right edge of the scene, it's about to move offscreen. 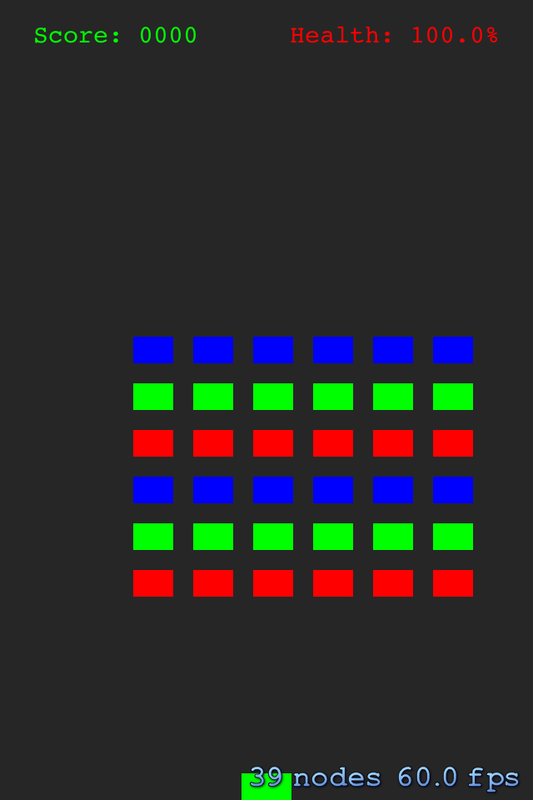 Set proposedMovementDirection so that the invaders move down then left. 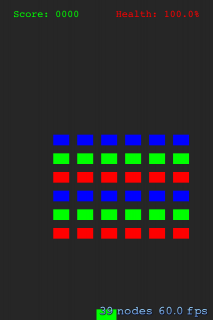 You compare the invader's frame (the frame that contains its content in the scene's coordinate system) with the scene width. Since the scene has an anchorPoint of (0, 0) by default, and is scaled to fill its parent view, this comparison ensures you're testing against the view's edges. If the invader's left edge is within 1 point of the left edge of the scene, it's about to move offscreen. Set proposedMovementDirection so that invaders move down then right. If invaders are moving down then left, they've already moved down at this point, so they should now move left. How this works will become more obvious when you integrate determineInvaderMovementDirection with moveInvadersForUpdate:. If the invaders are moving down then right, they've already moved down at this point, so they should now move right. If the proposed invader movement direction is different than the current invader movement direction, update the current direction to the proposed direction. Why is it important that you add the invocation of determineInvaderMovementDirection only after the check on self.timeOfLastMove? That's because you want the invader movement direction to change only when the invaders are actually moving. Invaders only move when the check on self.timeOfLastMove passes — i.e., the conditional expression is true. You'd be trying to update the movement direction way too often -- 60 times per second -- when you know it can only change at most once per second. The invaders would never move down, as the state transition from InvaderMovementDirectionDownThenLeft to InvaderMovementDirectionLeft would occur without an invader movement in between. The next invocation of moveInvadersForUpdate: that passed the check on self.timeOfLastMove would be executed with self.invaderMovementDirection == InvaderMovementDirectionLeft and would keep moving the invaders left, skipping the down move. A similar bug would exist for InvaderMovementDirectionDownThenRight and InvaderMovementDirectionRight. Note: You might have noticed that the invaders' movement is jerky. That's a consequence of your code only moving invaders once per second — and moving them a decent distance at that. But the movement in the original game was jerky, so keeping this feature helps your game seem more authentic. Good news: your supervisors can see the invaders moving now and have decided that your ship needs a propulsion system! To be effective, any good propulsion system needs a good control system. In other words, how do you, the ship's pilot, tell the ship's propulsion system what to do? Mobile games are not desktop/arcade games and desktop/arcade controls don't port well to mobile. In a desktop or arcade version of Space Invaders, you'd have a physical joystick and fire button to move your ship and shoot invaders. Such is not the case on a mobile device such as an iPhone or iPad. Some games attempt to use virtual joysticks or virtual D-pads but these rarely work well, in my opinion. Think about how you use your iPhone most often: holding it with one hand. That leaves only one hand to tap/swipe/gesture on the screen. Suppose you single-tapped on the left side of the ship to move it left, single-tapped on the right of the ship to move it right, and double-tapped to make it fire. This wouldn't work well for a couple of reasons. First, recognizing both single-taps and double-taps in the same view requires you to delay recognition of the single-tap until the double-tap fails or times out. When you're furiously tapping the screen, this delay will make the controls unacceptably laggy. Second, single-taps and double-taps might sometimes get confused, both by you, the pilot, and by the code. Third, the ship movement single-taps won't work well when your ship is near the extreme left- or right-edge of the screen. Scratch that control scheme! This approach is a little better. Single-tapping to fire your laser cannon makes sense as both are discrete actions: one tap equals one blast from your canon. It's intuitive. But what about using swipes to move your ship? This won't work because swipes are considered a discrete gesture. In other words, either you swiped or you didn't. Using the length of a swipe to proportionally control the amount of left or right thrust applied to your ship breaks your user's mental model of what swipes mean and the way they function. In all other apps, swipes are discrete and the length of a swipe is not considered meaningful. Scratch this control scheme as well. It's already been established that a single-tap to fire works well. But what about tilting your device left and right to move your ship left and right? This is your best option, as you're already holding your iPhone in the palm of your hand and tilting your device to either side merely requires you to twist your wrist a bit. You have a winner! Now that you've settled on the control scheme, you'll first tackle tilting your device to move your ship. You might be familiar with UIAccelerometer, which has been available since iOS 2.0 for detecting device tilt. However, UIAccelerometer was deprecated in iOS 5.0, so iOS 7 apps should use CMMotionManager, which is part of Apple's CoreMotion framework. The CoreMotion library has already been added to the starter project, so there's no need for you to add it. In this scenario, you provide CMMotionManager with a block that it calls regularly with accelerometer data. 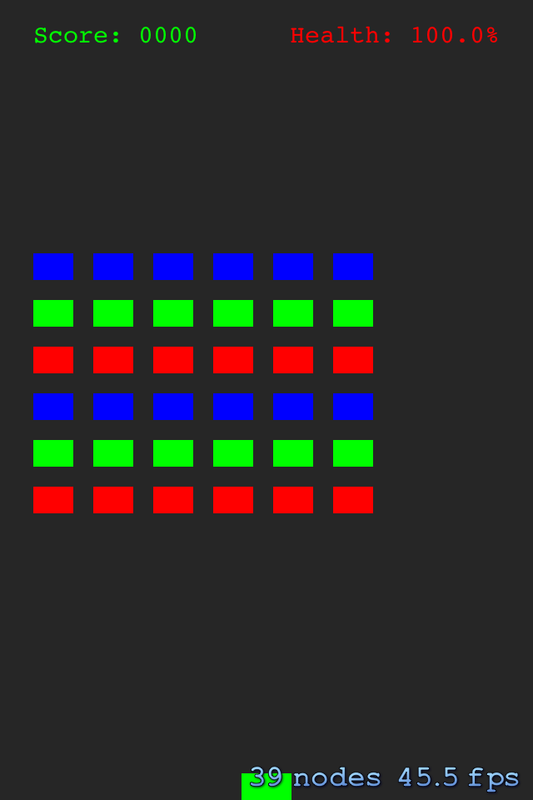 This doesn't fit well with your scene's update: method that ticks at regular intervals of 1/60th of a second. You only want to sample accelerometer data during those ticks — and those ticks likely won't line up with the moment that CMMotionManager decides to push data to your code. In this scenario, you call CMMotionManager and ask it for data when you need it. Placing these calls inside your scene's update: method aligns nicely with the ticks of your system. You'll be sampling accelerometer data 60 times per second, so there's no need to worry about lag. 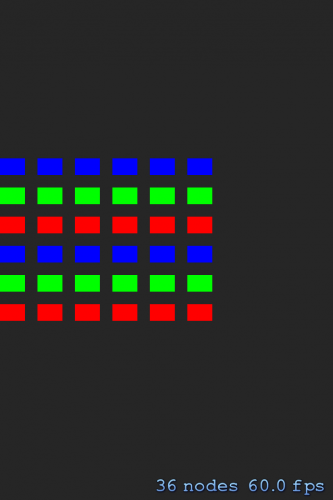 This new code creates your motion manager and kicks off the production of accelerometer data. At this point, you can use the motion manager and its accelerometer data to control your ship's movement. //4 How do you move the ship? Get the ship from the scene so you can move it. Get the accelerometer data from the motion manager. If your device is oriented with the screen facing up and the home button at the bottom, then tilting the device to the right produces data.acceleration.x > 0, whereas tilting it to the left produces data.acceleration.x < 0. The check against 0.2 means that the device will be considered perfectly flat/no thrust (technically data.acceleration.x == 0) as long as it's close enough to zero (data.acceleration.x in the range [-0.2, 0.2]). There's nothing special about 0.2, it just seemed to work well for me. Little tricks like this will make your control system more reliable and less frustrating for users. Hmmm, how do you actually use data.acceleration.x to move the ship? You want small values to move the ship a little and large values to move the ship a lot. The answer is — physics, which you'll cover in the next section! Sprite Kit has a powerful built-in physics system based on Box 2D that can simulate a wide range of physics like forces, translation, rotation, collisions, and contact detection. Each SKNode, and thus each SKScene and SKSpriteNode, has an SKPhysicsBody attached to it. This SKPhysicsBody represents the node in the physics simulation. Create a rectangular physics body the same size as the ship. Make the shape dynamic; this makes it subject to things such as collisions and other outside forces. You don't want the ship to drop off the bottom of the screen, so you indicate that it's not affected by gravity. Give the ship an arbitrary mass so that its movement feels natural. The new code applies a force to the ship's physics body in the same direction as data.acceleration.x. The number 40.0 is an arbitrary value to make the ship's motion feel natural. Your new processUserMotionForUpdate: now gets called 60 times per second as the scene updates. Note: If you've been testing your code on simulator up till now, this would be the time to switch to your device. You won't be able to test the tilt code unless you are running the game on an actual device. What do you see? Your ship will fly off the side of the screen, lost in the deep, dark reaches of space. If you tilt hard and long enough in the opposite direction, you might get your ship to come flying back the other way. But at present, the controls are way too flaky and sensitive. You'll never kill any invaders like this! An easy and reliable way to prevent things from escaping the bounds of your screen during a physics simulation is to build what's called an edge loop around the boundary of your screen. An edge loop is a physics body that has no volume or mass but can still collide with your ship. Think of it as an infinitely-thin wall around your scene. Since your GameScene is a kind of SKNode, you can give it its own physics body to create the edge loop. The new code adds the physics body to your scene. What do see? If you tilt your device far enough to one side, your ship will collide with the edge of the screen. It no longer flies off the edge of the screen. Problem solved! Depending on the ship's momentum,you may also see the ship bouncing off the edge of the screen, instead of just stopping there. This is an added bonus that comes for free from Sprite Kit's physics engine — it's a property called restitution. Not only does it look cool, but it is what's known as an affordance since bouncing the ship back towards the center of the screen clearly communicates to the user that the edge of the screen is a boundary that cannot be crossed. Here is the example project for the game up to this point. So far, you've created invaders, your ship, and a Heads Up Display (HUD) and drawn them on-screen. 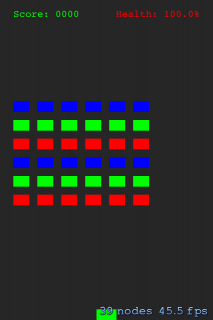 You've also coded logic to make the invaders move automatically and to make your ship move as you tilt your device. In part two of this tutorial, you'll add firing actions to your ship as well as the invaders, along with some collision detection so you'll know when you've hit the invaders — and vice versa! You'll also polish your game by adding both sound effects as well as realistic images to replace the colored rectangles that currently serve as placeholders for invaders and your ship. In the meantime, if you have any questions or comments, please feel free to join in the discussions below!